What form of tartan would the QR-H wear for their kilts? The only picture I can find is of a miniature painted red with black lines, but I also read somewhere they used the "government" tartan which is green and blue (w/black lines). Any idea which is correct? I know the red with black you are referring to. It is categorically and definitively stated to be "McNabb", but with no explanation why. Sorry. ust read this the other day and can't remember where. If I recall I will update. Mcnabb though does sound familiar. I would give the opinion that the red tartan is correct and that there is more evidence available to show the red then the use of the government pattern. The red tartan was the McNabb tartan The uniqueness of other elements of the Ranger's uniforms including Hussar busbies and Grenadier Bearskins suggests that they were outside of normal supply channels and had a lot of leeway in choosing kit. There were a lot of loyalist McNabb families in the Carolinas in the late 1770s. The highland companies of the Rangers were formed from Highland settlers who wanted to continue towear their everyday clothing so the enlistments of McNabbs is possible. 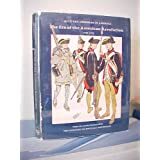 Plate #365 of the Company of Military Historians is in the first volume of their series Uniforms in America and shows a group of Queen;s Rangers including a highlander It was painted by the noted painter H Charles McBarron who is noted for his accuracy. Plate notes by both McBarron and the historian Rutledge F Smith states that the plate is based on a series of watercolors by Captain James Murray, an officer of the Rangers and are held in the Toronto Public Library. I have seen the originals and the kilt is definitely red. The watercolors and CMH print shows the Regiment's dress after 1778. I could not find a copy of that plate on line. As noted above Captain Murray may have been under political pressure to use the McNabb tartan but we will never be 100% certain either way. I would suggest that you would be as equally correct in using the McNabb Tartan as you would be in using the Government Patter. As colorful uniforms plays such an important element in the attraction for AWI gaming I personally would go with the red. The Highland company was the last raised. In the south. Might be some confusion there due to Allan MacNab claiming they were raised earlier and that they wore MacNab tartan kilts. He was head of the legislative council of Upper Canada in the 1830's and had delusions of grandeur which had to be bolstered by embellishing his service in the Queen's Ranger's in his youth. He actually joined quite late and was little more than a youth doing on-the-job training. If the Highland company wore tartan at all it would be Government tartan from the stores of the 71st. Also, there were no family tartants till later, so even if they wore another color, it wouldn't be linked to a family, it would just be that color and nothing more. History you are being too general about dates and the relationship between tartans and families. For example the Royal Highland Regiment Black Watch was formed in 1739 from a number f local highland companies that were organized by Clan Campbell. It was claimed at that time that the Watch was a Campbell Regiment and that the Government pattern Tartan they were issued with was a variation o the Campbell tartan that many of its men would have already been wearing The Campbell tartan is similar to Government pattern but is a bit lighter. 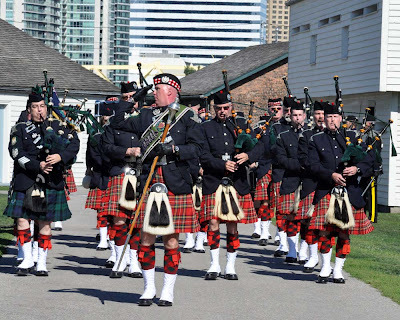 I would have thought that the kilts would not be worn too often in the Southern climate, and that overalls would be more likely (thus they would look more like late war 42nd or 71st, but in green coats). The Queen's Rangers Highland company were most definitely uniformed in Kilts from the stores of 71st. Almost a whole battlaion of the 71st. sailed into Boston after the British had evacuated to New York and stores were still being sent for 3 Battalions. The North Carolina Highlanders were also outfitted with kilts from the same source and blue seaman's jackets from naval stores. Regarding Clan tartans: they are a myth created by the Sobieski Stewart Brothers just before George the IV's visit to Edinburgh in the 1820's. The Black Watch being derived from Campbell tartan is in fact the other way 'round! Remember, for almost 40 years it wasl illegal upon pain of death or transportation to wear tartan out side the army. Since for most of that time there was only the 42nd. their tartan predominated. It's also a cheap, easily produce tartan with local dyes. So, Family tartans, outside of batches ordered up by chiefs for their households; didn't really exist before aabout 1820. District tartans, yes. obviously Wee Angus Mc Weaver would use the plants growing outside his cottage for dyes for his cheapest, bog-standard tartans. Flashy reds and yellows would only be for folk who could afford them. The Mc Nab tartan connection with the Queen's Rangers came from Allan Napier McNabb, the president of the Legilative Council of Upper Canada; his father was an ensign briefly in the Queen's Rangers and had himself painted in their " uniform" although it shows distinct Napoleonic era traits, and the McNab Tartan. There are pictures in the Toronto Reference Library, watercolours done shortly after the AWI; by an actual member of the Queen's Rangers showing all the uniforms of the Queen's Rangers and it shows the Highland company in blue and green tartan. The coats are short sleeved waiscoats with flapped pockets on the front. Dark Green. Diced bonnets, diced hose. Black leather equipment. No broadswords.